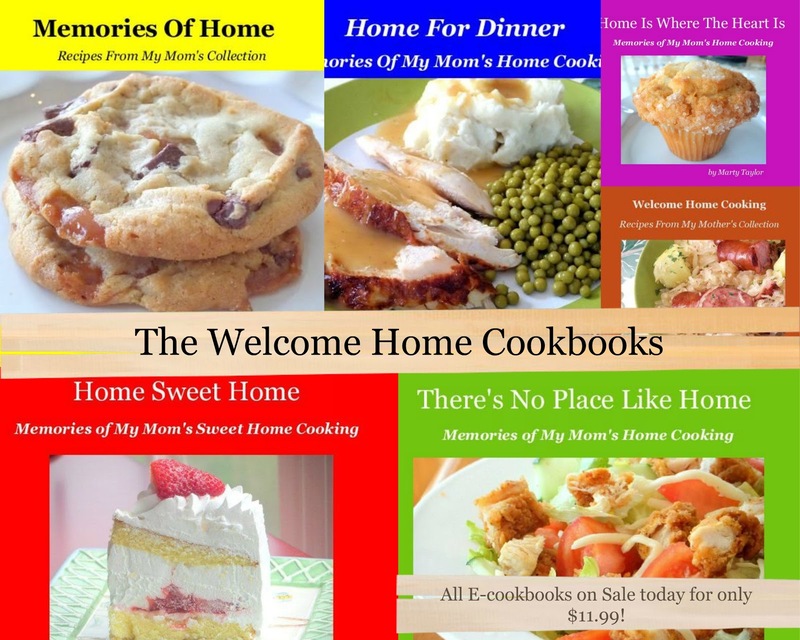 Welcome Home Blog: Cookbook Sale! I have 6 beautiful and very colorful E-cookbooks and they are available for those of you who yearn for good old fashioned, uncomplicated home cooked southern food. This is the kind of food that memories are made of and most of the recipes come to you directly from my Mom's old recipe box. Each Ebook is ready for downloading to your computer, laptop, Kindle, Tablet, iPhone or Android SmartPhone. All are compatible with the ebook reader you have installed on your device. All my books are on sale today for only $11.99. Choose from any of these of these on the list or buy all six to own my full collection. I have included links to each book. Please note: Some of the proceeds go to save the lives of dogs and cats who are killed in shelters while they wait and hope for their forever family to find them. Over 6 million dogs and cats will die this year while waiting. Some of the proceeds will help me feed and clothe the homeless. Together we can make a difference.